This is the "Hemlock Ring Blanket" that I made out of the two balls of Brett Marble Chunky yarn that Mom and sister gifted me at Christmas. 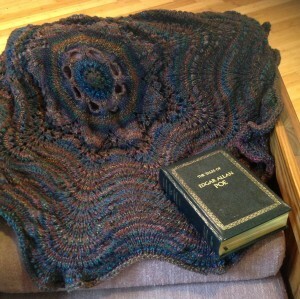 I finished this shawl two weeks ago at MegKnitsALot's house. I finally took pictures of it this weekend. The book is in honor of my sister, of course. My thought is that, since it is machine-wash, I will wear it at New York in place of a "Rhinebeck sweater." The tradition for Rhinebeck for serious knitters is to make a sweater specifically to wear/show off at Rhinebeck. Given that I will undoubtedly smell like buck goat, I don't want to have to wash a nice hand knit sweater a bajillion times with Orange Scrub. But an acrylic shawl that doesn't touch my lower arms/hands might not pick up so much funk and will be way easier to wash if it does. This page was loaded Apr 25th 2019, 10:20 am GMT.